Narendra Modi always had big plans for India. Born into poverty, he won a landslide general election victory in 2014, projecting his message across remote villages using wall-to-wall social media. Often appearing as a hologram, he convinced the people of India that he could complete his country’s journey to becoming a global superpower. Fundamental to his plan were universal healthcare, financial inclusion, access to education, and a strengthened Indian armed forces. On the security front he’s made great progress, negotiating unprecedented access to NATO’s resources without becoming a member of it. India has also participated in joint military training exercises and benefited from NATO’s current strategy of global health engagement, aimed at making friendly nations more prosperous and stable. I myself took part in one such public health initiative, designed to develop supportive treatment interventions for kidney transplant patients. 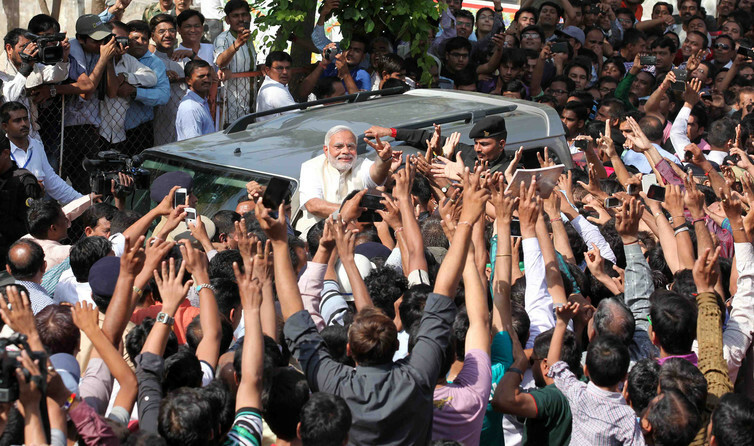 While I was there, I had moments to speak with Gujaratis to see how life was faring under Modi. It was a sobering experience indeed – and a very revealing glimpse of just how far India has to go on Modi’s plans to improve public health and alleviate poverty. From the moment I touched down in Ahmedabad, the largest city in Modi’s home state of Gujarat, it was obvious that India is a country with a plan. Edging into the city by car from the refurbished airport, we passed a military cantonment area with patriotic slogans painted on the walls. Children played cricket by the roadside. Early morning commuters congregated under the concave roofs of the newly installed rapid transit system stations, part of a system that feeds the new business district, Finance Tec-City. But you need fortitude to go about your business in Ahmedabad, gridlocked as it is with the shiny cars of the new affluent middle classes. And if you need a reminder that plenty of people are still struggling to keep up as the city and the country transform, just take the route I took on my daily commute to the hospital. Street barbers operate from single wooden chairs with mirrors suspended from walls. Women dressed in saris work on building sites carrying hot loads of bricks, keeping a watchful eye on their very young children nearby; people who’ve made their home on the pavement take bucket showers in view of all and sundry. All the while, the city’s array of luxury Western hotels make for an unpalatable contrast. At the hospital where I worked, many patients sleep on the floor. As the day progresses, more and more show up after travelling miles from rural villages. (One patient had hitched a lift on an elephant carrying goods to market.) Many patients present with conditions that have become chronic purely because local primary health care isn’t available, and their conditions cost them days of paid employment. The hospital operates on a pay-as-you-go basis, which demands that patients dig deep into their own and their families’ pockets – as well as the hospital’s seemingly endless reservoir of goodwill. Modi’s promised universal healthcare system could scarcely be more urgently needed. And yet, Modi has severely curtailed his healthcare rollout and slashed welfare spending to cut costs. His overriding assumption seems to be that if he creates opportunity, everybody will be ready to run faster, higher and stronger, propelling India towards becoming a global superpower. But if Modi could only move a little slower and look beyond the Western hotels lining the streets of Gujarat to the pavements outside them, he would see that worrying numbers of his fellow Gujaratis are too worn down by poverty to compete in an unaccommodating market economy. They also face structural obstacles. Despite the government’s best efforts to relax the rules demanding official identity documents, the poor still struggle to open bank accounts. Many lack the confidence needed to negotiate the banking system, to say nothing of the money for a deposit. Older children still work instead of going to school – meaning their families survive, but remain poor. The confidence of many Indians is at a deep low, and they need a little more tender loving care along the road to global superstardom. But if Modi sticks to the course he’s charted, he will leave a big chunk of his people. That’s not just a threat to the people concerned; it’s a potential political disaster for Modi himself, and a potential crisis for India’s security. If the poor are left behind in their hundreds of millions, they will be easy marks both for Modi’s political opponents and for the various extremist groups operating in India – radical leftists, violent Hindu nationalists and jihadists among them. Yes, India’s government has big plans afoot. But they’re moving very slowly – and if they don’t speed up, the consequences could be dire. This article was republished on The Mecca Post with permission from The Conversation. The original article here.